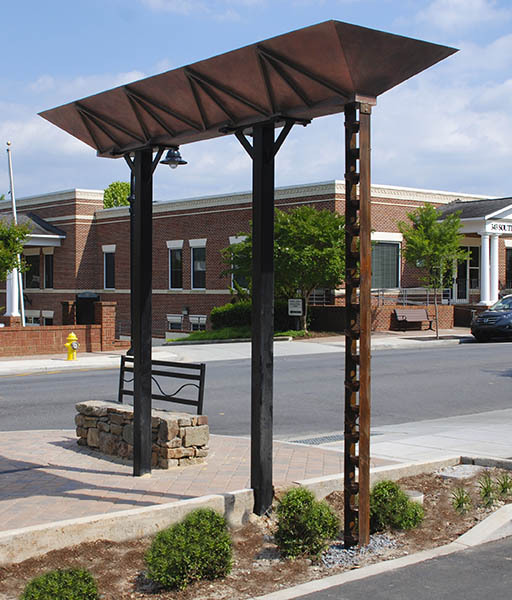 This sculpture was commissioned by the Town of Wake Forest, North Carolina, in 2013. It celebrates and calls attention to the rainfall that feeds the area's forests by storing enough rain to trickle down a chute of canning funnels for a number of hours afterwards depending on the size of the rainfall. It creates an event in the historic downtown. The stainless steel has a patina to match the history and the design reflects a nearby train trestle.